Diving Bohol takes place in three distinct regions: on the south western tip is the well-known marine sanctuary of Balicasag Island; further north in the Cebua Strait, is Cabilao Island, and also in the newer dive destination of Anda to the south east. On the south western tip, the well-known marine sanctuary of Balicasag Island, has long been the main draw card for divers. It is accessed from the dive centres based on Alona Beach on Panglao Island. 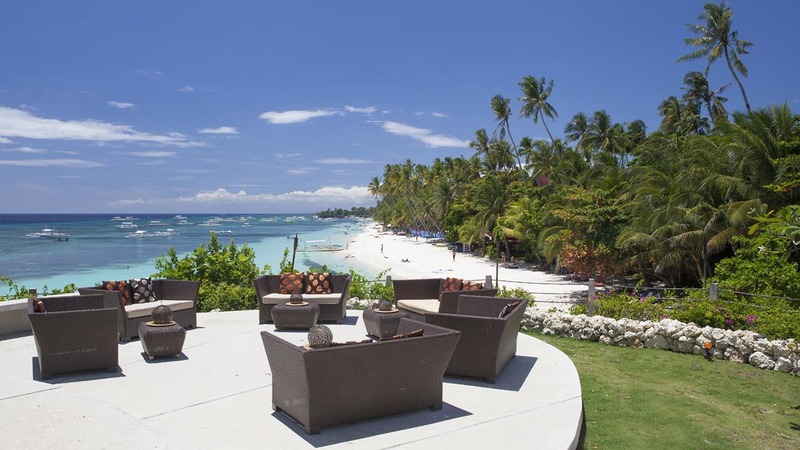 Our recommendation for a local dive operator is Sea Explorers who have a dive centre right on the beach with accommodation at the Alona Vida Beach Resort, and also, a dive centre in the decidedly luxurious Amorita Resort on the cliff at the quiet end of the beach. 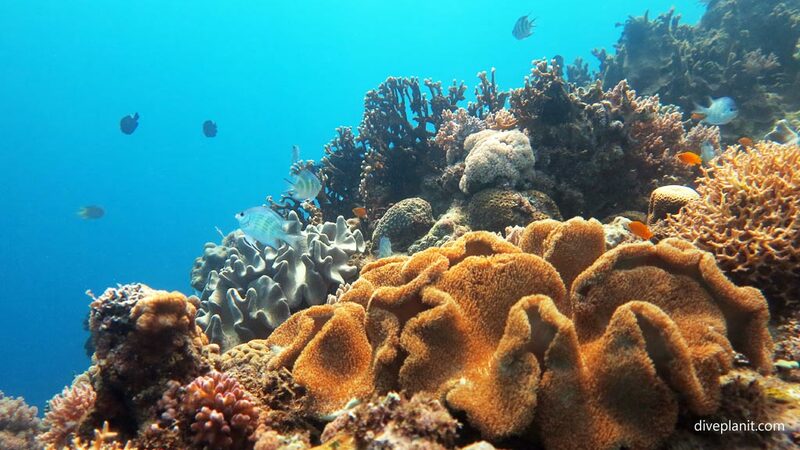 The reef in Cabilao is still very much intact and has a rich diversity of marine life. There are many types of pygmy seahorses, angler fish, stargazers, nudibranchs and ghost pipefish. 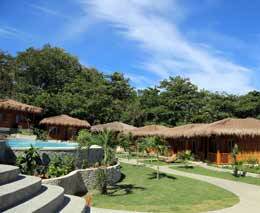 Our operator pick in Cabilao is Sea Explorers Cabilao at the Pura Vida Beach & Dive Resort. On the south-eastern tip of Bohol is Anda, a newer diving area, with a more secluded selection of resorts. Our pick for dive operator is the Magic Oceans Dive Resort – a very recent addition with the benefit of right on the water’s edge. 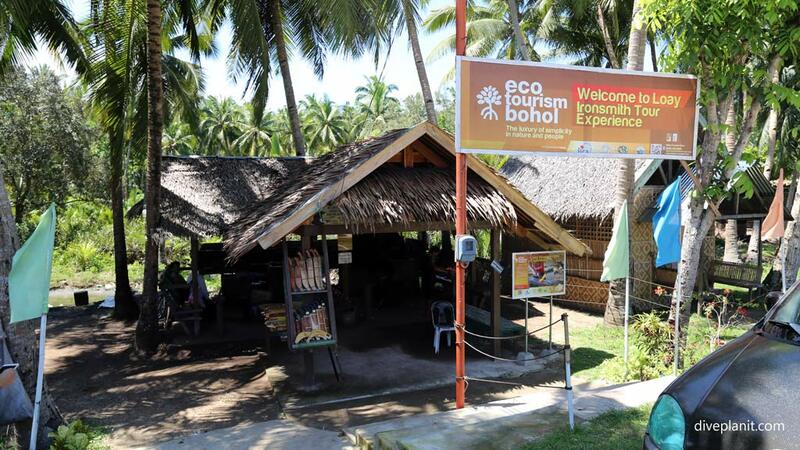 Bohol is pretty central within the Philippines geographically. It has a busy ferry port and access to adjacent islands, but from the airport you can only get to Manila. Balicasag Island, south of Bohol, which is a marine sanctuary has long been the main draw card for divers. It is accessed from the dive centres based on Alona Beach on Panglao Island. 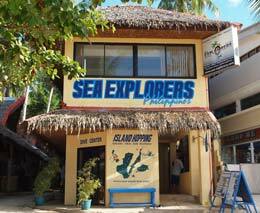 Sea Explorers Dive Centre run the diving for two resorts at Alona Beach Resort – in the middle of the beach, right where the action is; and the Amorita Resort, situated at the quiet end, on a cliff overlooking Alona Beach. Cabilao Island in the Cebu Strait is also easily accessible from the port and airport of Tagbilaran. Good vis, mild currents and a variety of dive sites within a short boat ride of the resort make this a desirable dive destination for those just wishing to dive and relax. There are a number of dive resorts around the coastline of Anda on the south eastern tip of Bohol. The newest is the Magic Oceans Dive Resort nestled on the southern tip of Anda, it is one of the few at the water’s edge. 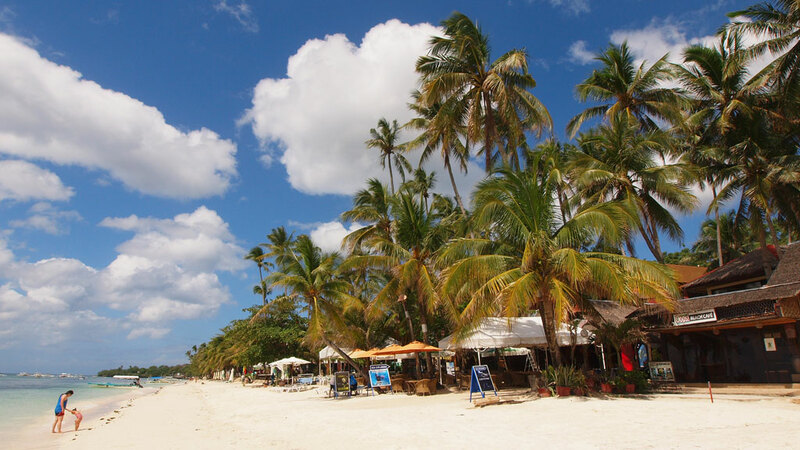 Alona Beach has received new regulations (Feb 2016) concerning diving at Balicasag Island. First, to make sure that the area is continuously protected, there is a limit of 150 divers only allowed per day with a maximum of 300 dives. Second, any diving courses are not allowed anymore to be done in this island. 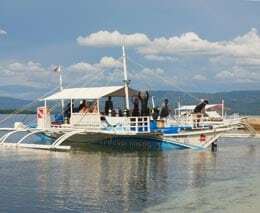 Third, there is an implementation of higher rates set for the dives in this island compared to the dives in the other sites around Alona Beach. That means, every diver needs to pay a surcharge of 250 Peso on the spot per dive in Balicasag. Lastly, dives at Balicasag cannot be confirmed ahead of time and can only be booked locally. Any registered divers in Balicasag cannot be cancelled once confirmed. With these rules and regulations, the local government tries to protect the area around Balicasag to preserve the nice coral gardens as well as to care for the marine life in the interest of all. Cabilao has a variety of diving terrain, from its stunning drop-off at The Lighthouse, thick with marine growth, to coral reefs and seagrass fields in the shallow areas. As such, it has a diversity of marine life from nudibranchs to stargazers. Between January and March some thresher sharks may be spotted in addition to the usual, white and black tip sharks. The reef around Anda runs in the north west around the south to the east. It starts as a 10m drop into sand and gets deeper as it travels south and shallower again around the point. 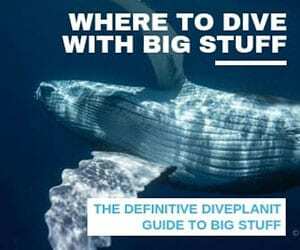 This gives a mixture of dive sites, from shallow shelving reefs, where you could learn to dive, to large sandy bottoms, to steeper reefs and 30m walls to keep even the most advanced diver interested. You can see everything from nudis, to pipefish, pygmy and regular seahorses to eagle rays and turtles – sometimes on the small dive! So called because in the summer the grass on the thin layer of earth covering these almost hemispherical domes of earth turns a chocolate brown. They were created 40 million years ago when the seabed rose exposing these coral rock mounts. The softer material was washed away leaving just over 1,100 of these curious mounts. The lookout point is on one of the highest giving a 360° vista over the hills and the rice paddy is below. Habitat is more than just a butterfly sanctuary, as they have exhibits of all manner of butterflies, moths and other flying insects. After an educational introduction you can wander around inside the enclosure and see the butterflies and moths up close. 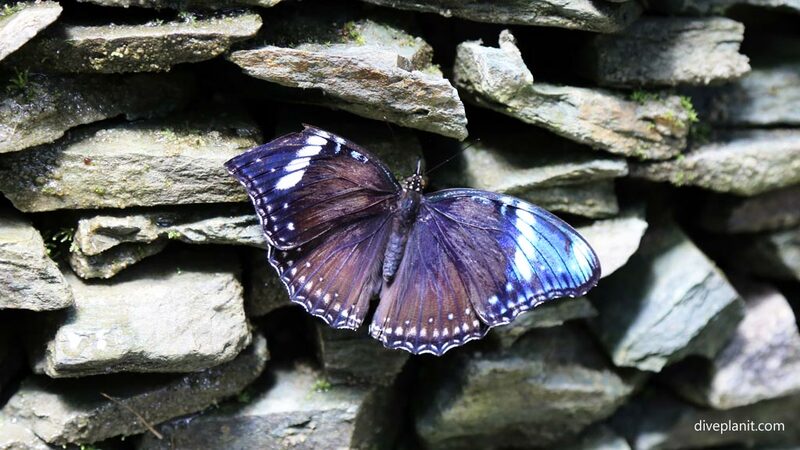 Some of the butterflies have an almost holographic colouring on their wings which makes them look drab from straight on but iridescent blue from a certain angle. Another has two strange traits: the first is the ability to smell of chocolate, and the other is to play dead in your hand until you allow it to fall at which point it flies away. After the visit you will notice that there are always butterflies around, whereas before the visit, you would hardly notice them at all. 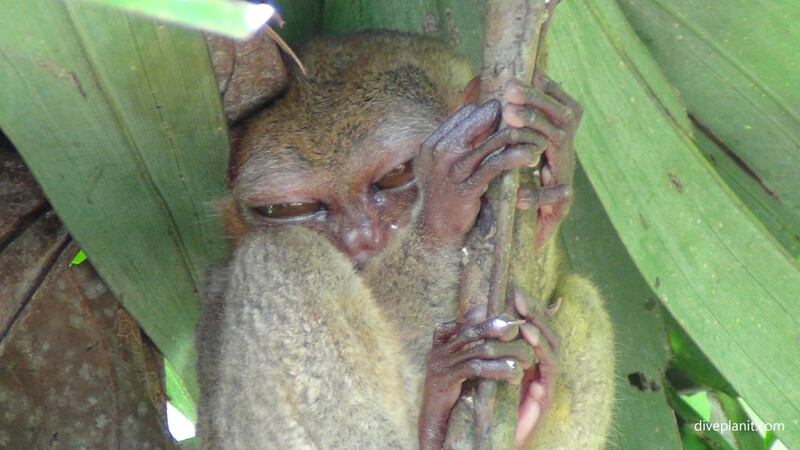 The tarsier is a pro-simian primate, a monkey with a tail, amongst the smallest of such primates in the world. They are loners, and nocturnal so the ones you see dotted around the sanctuary and pointed out by the numerous staff are mainly sleeping quietly in the branches of trees. No flash photography is allowed but with a reasonably long lens on even an iPhone 6 or equivalent you can get a reasonably clear shot of this curious little cutie. 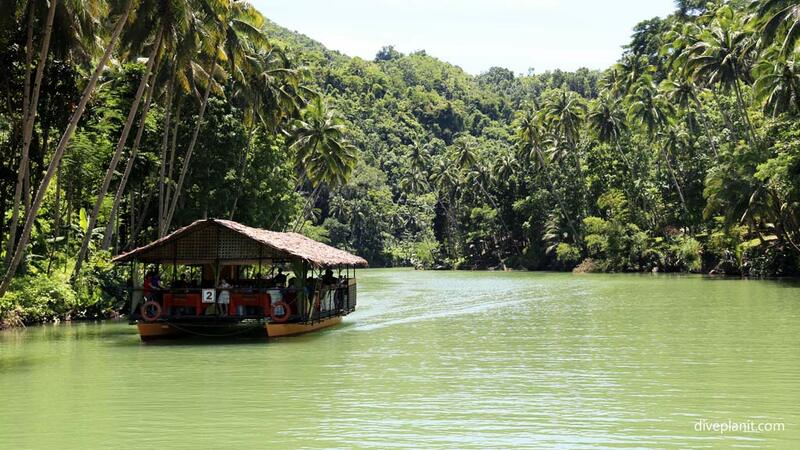 No trip to Bohol would be complete without lunch on the river Loboc. It’s a simple but very relaxing affair: a generous lunch on large barge which has a buffet in the middle and tables all around the edges of the barge. 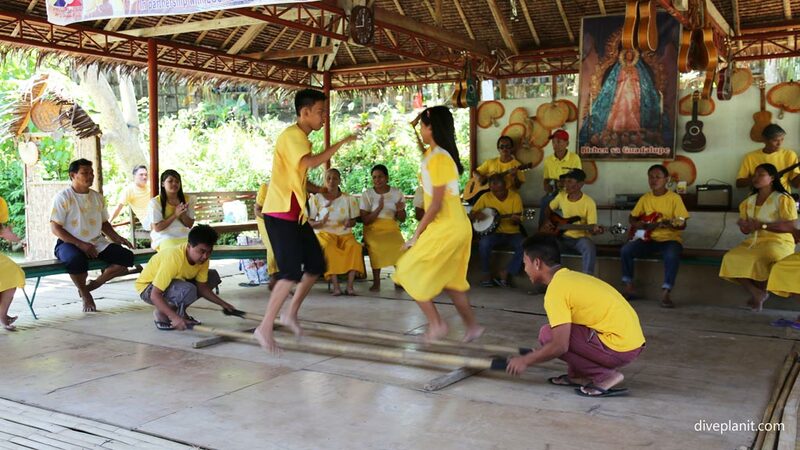 Then an hours round cruise up the river to the falls, berthing on the way opposite a stage to be entertained by dancers from local villages. 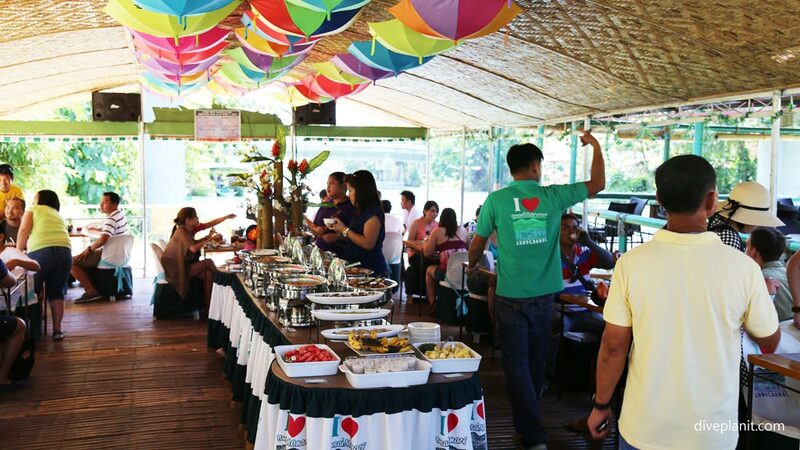 An opportunity to mix with locals and feel the bonhomie of the Philippine people. Simply take a trip through the countryside. In Bohol there are very few poor people (and very few rich). 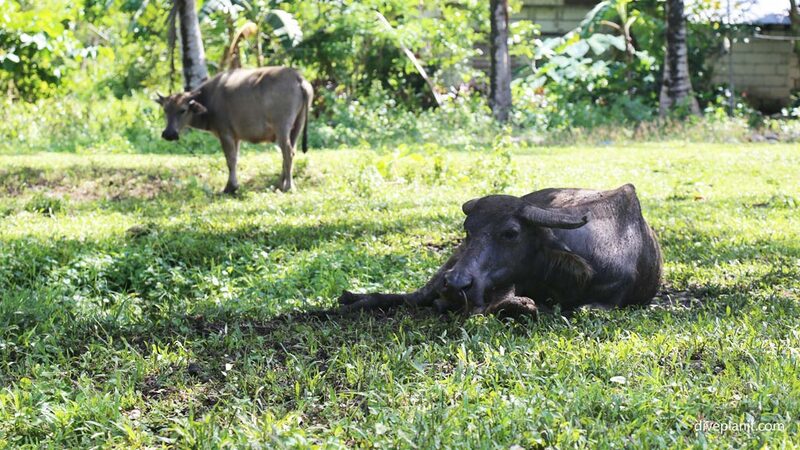 Most of the inhabitants of the interior work the land and you’ll see rice paddies at various stages of being ploughed by buffalo drawn ploughs, planting, weeding and harvesting. There are also coconut and banana groves and most houses have their own extensive kitchen gardens. There are also traditional houses made of wooden frames with bamboo panels raised on stilts. And metalworking shops where they convert old steel suspension springs into knives and machetes of various shapes and sizes. With Bohol’s population being 95% Catholic will also see plenty of churches along the way. Unfortunately many of the older ones, and we’re talking those built in the 1700s, have been damaged in the 2013 earthquake and are in various states of (dis)repair. The climate is drier than adjacent islands, but still in the interior, paddy fields, banana and coconut groves abound. 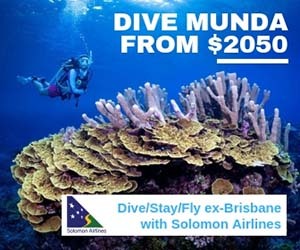 The better time to dive is in the dry season, from November through to May. 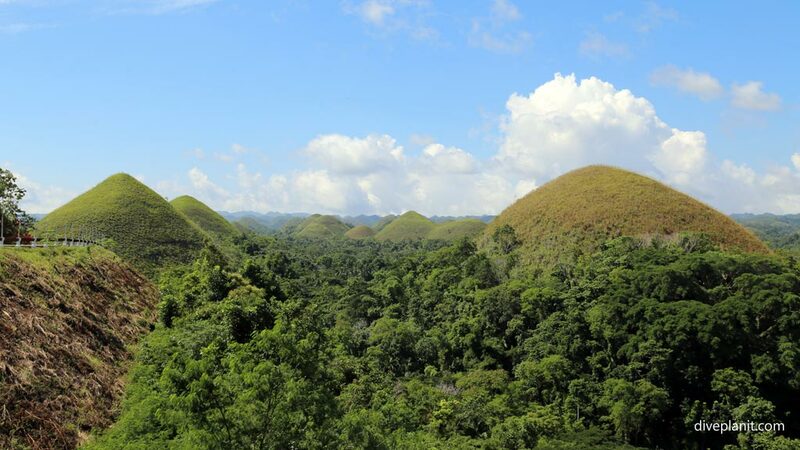 But like the rest of the Philippines, Bohol is really a year-round destination. Tagbilaran is the capital and is the main entry point into Bohol. The airport and ferry ports are right in the middle of town, and are of that size where within minutes of disembarking, you’ve got your luggage and are on your way. But note, Tagbilaran airport is only a spoke, not a hub, so the flights from Tagbilaran are only to Manila. Cebu is an international and domestic airport and has many more connections. 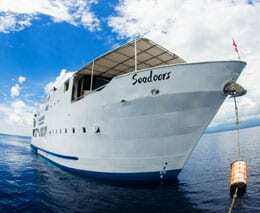 You can also get a ferry to and from Cebu (about 90 minutes) and Dumaguete (60 minutes).